The Albanian Alpinist, Jelena Peshkatari, has successfully climbed to Aconcagua, Andean peak in Argentina, with a height of 6962 meters, the highest Mount in America. Through a post on the social network "Instagram" she was happy about this experience, while there was also a message for Albanian women and girls. "I am very happy about this achievement and experience. 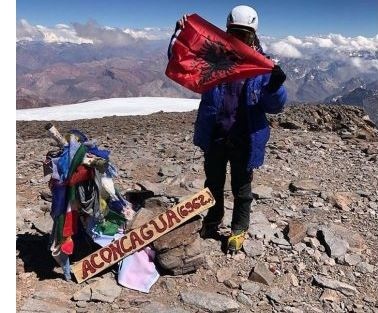 I hope from the heart that more Albanian women will climb the highest peaks of the world and be part of the mountain and mountaineering expeditions in the future," she wrote.